Menudo – A Hearty Soup before the Parade! In Mexico, a classic remedy to recover from a late-night party – whether aggravated by a hangover, or simply, due to fatigue – is to have a nice bowl of Menudo, a traditional cow’s stomach tripe soup. Although it might be hard for some to fathom the concept, let me beguile the acceptance of this delicious food by pointing out that: bowel tripe is routinely used as sausage casing; organs, such as liver and kidney, are put in pies; and of course, there is haggis, the Scottish delicacy of sheep organs encased in, yes, the animal’s stomach. Thinking rationally, the use of organs and tripe in traditional dishes makes sense, since old-time kitchens were always anchored by the “no waste” philosophy. In Mexico, stomach tripe is called pancita (which means “tummy”), and sometimes the dish is referred that way around Mexico City. There are many styles to prepare this concoction, but the general principle is that this soup, with a well seasoned broth and some protein from the tripe, will nourish, rehydrate and replenish lost electrolytes in the body, especially after a late night of drinking and partying. I like to eat this soup on any cool and relaxed Sunday morning; since Mexico’s Independence Day celebrations started last night, I am sure that many Mexicans found it imperious to consume a bowl this morning; they might even be enjoying it right now, while getting ready to catch the Independence Day parade, either as attendees, or like me, on the screen. I also wanted to include a link to a video from last year’s parade (2017). I chose an amateur video instead of the official version, to get a more picturesque point of view. I am joining the What’s for Dinner? 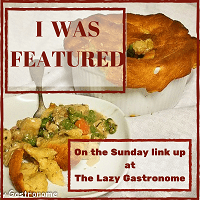 – Sunday link-up #166 hosted by Helen @ The Lazy Gastronome. Oh, yum! Que rica la vida. I love your dad’s photos, as well. Really captures another era! We love menudo at our house. My husband makes it and sometimes pazole (and sometimes we mix them!). Thanks for sharing at the What’s for Dinner party! It is so nice to learn that you and your family know of and cook Mexican food; I tried the menudo with hominy for the first time for the post, and yes, it is yummy, too. Thank you for hosting another great party, Helen! I would love to try this recipe, perhaps sometime soon I will come across some good tripe again. Growing up (in the 70’s) Dad would come home from wherever he was finding food in New York City, and we’d be eating just about anything. Actually, like Dad, I thrived on this. I’ve had Italian tripe marinara on Arthur Avenue in NYC, and a few preparations Dad made at home. Have yet to try Mexican menudo, but will reserve this recipe until I … can. Thanks! Italian tripe marinara? That sounds intriguing! I was always very reluctant to cook tripe because of the cleaning and long cooking hours, but nowadays, those portions neatly cleaned and pre-cooked are so convenient. I hope you get to try menudo soon! Yeah, my husband will not try it either 😦 , but he likes hominy soup a lot. I will be posting my recipe soon; it has no tripe, but it is equally delicious! My mom liked tripe. It’s an Okinawan thing apparently. I couldn’t get myself to try it though. Oh, I did not know that! Was it in soup or another kind of dish? As a kid, I never tried the soup, but used to love “pancita” as a filling for quesadillas. I think it is a texture issue: if you like gelatinous savoury food, you probably will like tripe; if not, better stay away. She put it in a soup mostly I think. She liked cooking pig feet soup too so I guess it is that gelatinous thing. Thank you, Cathie! I hope you try the soup; in some places in Mexico, the red sauce is served on the side instead of pouring it in the soup, so that is a nice option for a mild taste. I think it is beautiful and so true how homesteaders honour the good lives of their dear animals by respectfully managing them with no waste; in one of my favourite chapters in the Laura Ingalls’ books (The Little House in the Big Woods, The Little House on the Prairie, etc. ), her Pa is cooking a pig and she is hopeful she will get the tail, which is roasting on a stick.